Why carry two different gadgets when only one can do everything. Yes, I’m talking about your laptop. Stop carrying your laptop everywhere because your smartphone/tablet can do almost everything that your trusted lappy can do. All you need is a simple bit of equipment. Like the UNITEK Y-3068 3-in-1 connector. 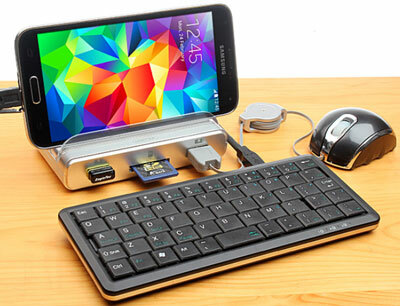 This portable gadget transforms your smartphone or tablet into a computer via the power of the OTG port. Get rid of all the heavy gadgets because this little device will turn your mobile into a fully functional PC, or something really close. 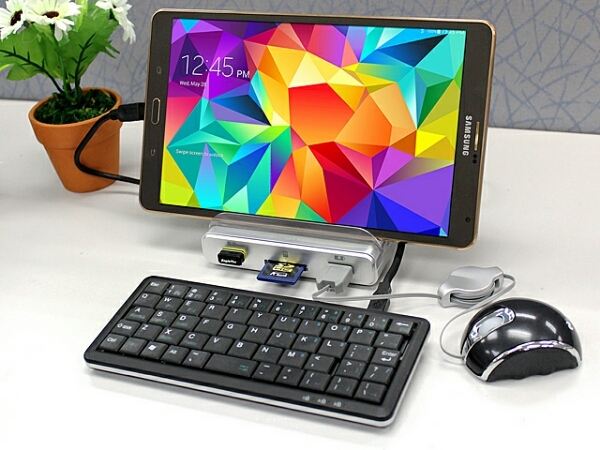 The fancy dock comes with 3 USB 3.0 ports – which are also USB 2.0 compatible – to connect extra peripherals like a keyboard and mouse to your phone, and in addition it also sports a SD Card reader port, and a basic style smartphone stand to hold your device at a suitable viewing angle. The product can also charge up to 3 devices simultaneously with the provided AC adapter. The UNITEK Y-3068 USB 3.0 3-Port Hub with OTG + Smartphone Stand is available for $55 via Brando. Do they have a version with a touch pad? Do you mean a tablet version? They only have one suitable for smartphones or 7″ tabs. No I think he means do they have a version with a trackpad built into the keyboard instead of using a mouse? I think they don’t at the moment. Hi, yes that’s right. I’ve been hunting for a small keyboard with a pad. This is probably the thing you need – http://www.amazon.co.uk/Portable-Bluetooth-Wireless-Sensitive-Scrolling/dp/B00IL4QIQM/ . We had something similar and it was excellent. And a great price. That’s spot on. I’ve seen others but they seem too small. Thanks. thanks for the article man. by the way guys, last week i applied for an iphone5 test and keep and wanted to share with those of you who are interested. i basically just signed up and they contacted me, they’re trying some features with beta testers.